NELSON: This is true. The wonderful part about that, too, was that they got people like Gilda, and people like Wally Bogue - who nobody ever heard of, but Jim loved. Wally worked that show for years in Disneyland, and nobody knew him. I remember the first time I went to Disneyland, I went with Jim. Jim took me there. He said, "Youve got to see this guy!" He was so excited about seeing Wally Bogue. Wally made me laugh the whole time I was there, and it was great having him on the show. Same with Senor Wences. A guy who had sort-of a heyday in Ed Sullivan times, but a lot of young people wouldnt have known who he was. These performers who were like this, Jim loved them. He wanted other people to see these people. NELSON: It was indeed. When Senor Wences came for our read-through that we had on Sundays, he did his show for all of us. We were all like little kids sitting there watching him it. It was so wonderful. Jim Henson performs Kermit on the Ed Sullivan Show. Jerry Nelson assisted during many of these performances in the late sixties and early seventies. How many times did you encounter him while doing "Sullivan" appearances? NELSON: Never. Jim may have, because certainly Jim did more shows than I did. I didnt do all of those shows. You know who I did encounter there, as an addendum since he died recently, was Flip Wilson. Either the first or second time I did the "Ed Sullivan Show", I see this guy, and hes pacing back and forth. You can tell hes nervous, so I said, "Whats up, man?" He said, "Aw, Im a standby comic." "Whats that mean?" He said, "Well, if they have time or someone gets sick or something happens, then I get to go on." I said, "Oh wow, man." He said, "Yeah, its a drag." As it turned out, he did not get to go on that night. He did eventually make appearances. NELSON: Yeah. He was a great performer and a funny guy. I remember him very fondly. Did you ever do any of the "Flip Wilson" appearances? NELSON: I dont think so. I dont think I had any characters then. I may have had Herry Monster fairly early on, because they thought, "Well, you dont have a monster. Lets give you a monster." I think thats one of the first characters I did, other than Herbert Birdsfoot. And Richard joined the show in 72, right? NELSON: I believe so, but Im not positive about that. He would come in once in awhile and do things. In the early days, occasionally they would need someone else, and even Jane would come in and do a right hand. Fran Brill was there for a little while, and then she decided she wanted to pursue her acting career, which she did. Then she rejoined the company again. NELSON: That was the first time Jim really kind-of walked away, although he participated, especially at the beginning, it was the first time he left it basically to others. I think he knew by then that everyone had the same concerns as him that the work was quality work. Jerry Nelson performs Gobo alongside Karen Prell's Red on the set of Fraggle Rock. Was there an audition process for the characters, or did he approach you and say, "I want you to perform Gobo?" NELSON: I think we all auditioned for those characters. I think when I read it, I said Id rather do Boober, and Jim said, "No, I want you to do Gobo because hes the one that holds everyone together." "Fraggle Rock" strikes me as a show that stands up well to the test of time, even more so than "The Muppet Show". NELSON: I think it definitely does. Its about relationships. Its not always as funny as "The Muppet Show", even though there are a lot of funny moments. It also strikes me as a more musical series than even "Sesame Street"
NELSON: Its so vast. I remember Phil telling me, "Oh, I write five songs a day. A lot of them are terrible, but I sit down and write five songs a day. Sometimes one of em is real good." Thats the kind of dedication and determination all of the crew and everybody had. Focus is probably the key word that comes into play with everything that anybody endeavors to do in life. "Fraggle Rock", I think, was the culmination of team effort in terms of putting it together. All of us think it would be so great if we could find another project like that. What do you see as the strong points of the show? NELSON: Everything. The story. The overall scope and concept of the show. The interrelationship of the characters. Jerry Nelson performed Gobo Fraggle with incredible versatility and passion. A very final thing, yet it was the hope of a beginning. It was a mutual agreement for the show to end when it did, right? NELSON: Well no, it wasnt. What happened was that the show was a co-production between CBC and HBO. HBO, at that time, felt that they were over-extended and needed to cut back, and "Fraggle Rock" was one of the places where they did that. CBC would have been perfectly happy keeping it, and, in fact, they tried to find some other way to carry on with it. Another season would have been ideal. "Oh, we havent done this with Ernie yet. We havent done this with Tell yet." So after "Fraggle Rock" came the segue into the "Jim Henson Hour"
NELSON: Yeah. That was the next big project. Im not sure why that project didnt work. I thought it was a good show. It may have been that it was too much to see something like "The Storyteller", and then the Muppets. The other shows that we did within that framework, like "Dog City", were wonderful. The atmosphere in that show was fantastic. So were the others, like "Cloud Forest." I do want to ask you, before we wrap up, how you would describe your relationship with Richard. Friends and performing partners, Jerry Nelson and Richard Hunt enjoy their time together on Fraggle Rock. NELSON: Richard came into the company when he was pretty young, and I kind-of took Richard under my wing, when he first came in, since Frank and Jim were sort-of a team and I was like a straight man or foil that worked off their characters. So when Richard came in, we got to the point where we would work really well together. When one of us would start to go somewhere, the other would know what was happening. We played well together. Like with the Two-Headed Monster. We were just goofing around on the set one day, without a puppet even, and one of the writers was there and said, "Whats that youre doing?" And we said, "One monster with two heads!" And they decided to do that. We had a lot of characters that worked together, like Floyd and Janice. We were good friends. When we had someplace to go, we would travel together. He was always so late that it used to drive me crazy. Eventually Id say, "If youre there, Ill see you at the plane. If youre not, Ill see you where were going." Richard and I were like what Steve and Dave are now. You find somebody you work well with, and have that rapport with. I knew all of Richards family - his sisters and brother - and wed spend time together. When did Richard find out he was ill? NELSON: Im not sure exactly when. Once I got married, we didnt hang out as much, and he did other shows, like "Faffner Hall", so he was away in England. When he told me about it was about two years before he died. And he had a "Going Away Party" for himself, right? Was it similar to what you did at Jims funeral? 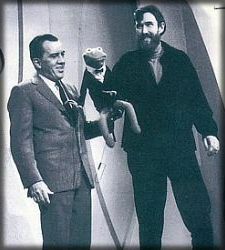 Jerry Nelson and Richard Hunt's characters were often paired together, such as Floyd and Janice on The Muppet Show, and the Two-Headed Monster on Sesame Street. NELSON: This was a thing with Richard and the puppet, but I cant really remember what it was we said or did. The company had a whole separate memorial. There was another memorial held after he passed away, which was also held at St. John the Divine, but in the Chapel. The company had a going away party, but by that time, Richard was in a wheelchair. The company put together a Richard Hunt puppet montage of bits that Richard had done. They showed that, and everyone hugged him and kissed him and told them they loved him. Its ironic that, after Richards passing, you took up the character of Statler again... The only character I can see not returning is Scooter. NELSON: Yeah, that was very much Richard. When Richard joined, he was such a bouncy little puppy. We had to squelch him all the time. He was totally just exuberance gone mad. Just bouncing all over the place. It would be nice to see Janice too, and Im sure someone will eventually pick it up. Its a lovely character. He made her such a gal. From what youve seen, what is your opinion of "Muppets From Space"? NELSON: I think it will be a good, funny film that people will enjoy.